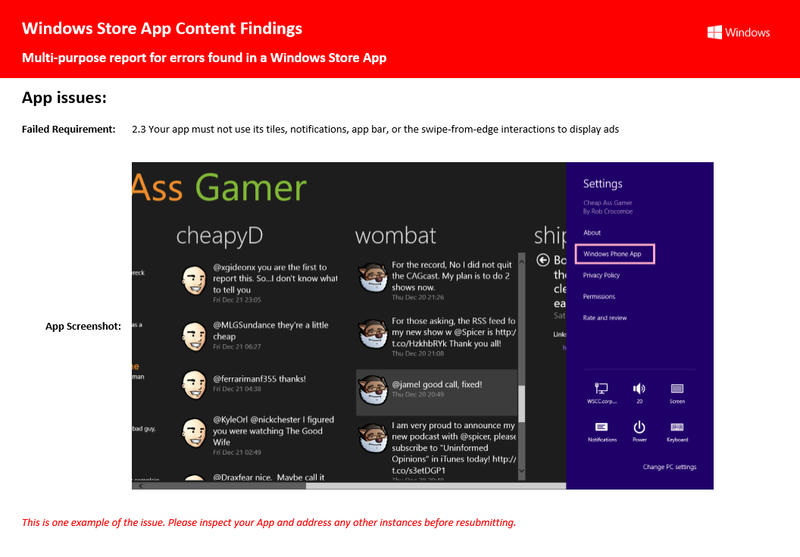 Woke up this morning to find the CAG app had failed certification, aaaw :( The tester at Microsoft stated that ‘The app bar, and/or Windows Settings charm appear to be advertising to our reviewers’ and this picture was provided. To be fair, it is a very good report, telling me exactly what was wrong. All very good. I’m not too happy with the actual reason it failed though. I have a link to the Windows Phone version of the app on the charms bar, just to increase awareness that this app is also available in that platform. Advertising a Windows Phone app, a Microsoft product, is against their rules?